I Love this comforter! I looked in stores everywhere and what a waste of my time! Anything of this quality was at least twice the price, or if it was of similar price in the store, it was not as nice material. The color is a gorgeous light mint green, pretty true to the picture online, and the material is so soft and silky I love the feel. It is also thick feeling but puffy and light weight. The decadent serenity of mint green will dress up your bedroom with refreshing, alluring style in this comforter set. Plush pin tucks lend softness and depth for ultimate luxury, and the entire set is machine washable for your convenience. I likes the bed spread but it isn’t any where close to the color it says it is. It is more of a mint green then a turquoise. I was very disappointed In that. Very soft but not as tufted as the picture. I also thought I had ordered a duvet but it was comforter. I still like it because of the softness of the material. But very disappointed in the color. Color was true to picture. Fits our king mattress well. Purchased this specifically because it was oversized. Light weight and soft. I would prefer a little heavier but it's good for summer. I was worried this comforter might be too heavy/hot because I assumed the pin tucks meant extra fabric, but it’s not at all. It’s just right. It’s light and breathable, but still fluffy and cozy. The color is exactly as pictured. I only didn’t give it 5 stars because it’s not super luxurious or expensive looking. It’s still very pretty though! My Granddaughter Loves her new Comforter Set! Beautiful light mint color. I love it! Beautiful. I mixed it with grey sheets and grey accents in my guest room and I am in love with the look. My daughter loves the color and says it is very soft and comfortable. It has been through the washer and dryer quite a few times now and has held up without any noticeable wear. The perfect pale mint. Barely there colour, just enough to be spa like. My bedroom is a retreat. Very soft and pale color, washed with no problem, very happy and would recommend! This comforter exceeded expectations. The color is a soft mint..and it is so soft. Also the weight is perfect..it is not heavy but keeps the warmth. I'm considering getting the white for the summer. Very pretty color, but within a couple days it was ripping. So I had to toss it. True to the color. Very sad caused I loved the color, and how it brighten my room. This comforter is so GORGEOUS and SUPER soft that I ordered a second one in white so I can alternate them. Cute bedding set! I wish it had a few more pin tucks but it looks really nice. Warm and nice color! Goes well in our bedroom and it is nice and big! Would buy again. It is cute but more of a mint color then aqua blue what it looks like in the picture the only complaint I have is it dident fit in my washer or my moms has to go to laundry Matt all the time so I ended up getting a different comforter! I am obsessed with this comforter. I normally get tired of my bedding after a year or two, but not this one. It's so fluffy and soft. The stitching also adds a nice touch. "when will queen sizes be back in stock?" We hope to have it back in stock in about 2 months. I love the color and the material. I think it is beautiful. "Are extra shams available for purchase for this set?" Unfortunately no. We apologize for nay inconvenience we might have caused. 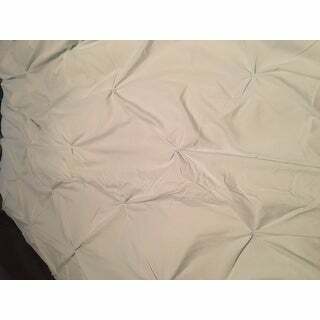 "Is it the color in the picture or the color I see in Hint of Mint Waves Handcrafted Series Comforter which that pictures looks like a bright green? I really want the color I see in the picture a soft light bluish-green. Is there a way to get a swatch of the true color. I would buy but don't want that bright greenish color." "Is this more minty green or aqua bluish? It looks more blue to me and that's what I'm looking for. Thank you!" It is an aqua blue tone. "Does this include the pillow shams or just the comforter?"